This machine is used for Stitching the Corrugated sheet to sheet to make Complete Box, the machine is designed for accurate stitching of corrugated boxes and available in straight /Angular/Bottom models. This Machine is used to stale and make Corrugated Box from Corrugated Rolls on different Sizes. Suitable for cardboard,corrugated board using round or flat wire. 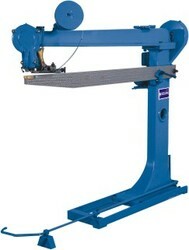 Available in arm length of 20",30",42" and 48"
Speed up to 300 stitches per minute.